In magnetic coolant separator (magnetic dust separator), the coolant fluid with iron dust particles falling by gravity to the inlet of the separator from the precision machine tools such as grinders, milling machines, automates etc. The coolant with iron impurities come into contact directly with magnetic drum and extracts all iron particles. The magnetic drum is kept clean all the times by a scraper blade along the circumference. A rubber roller squeezes the sludge gathered to ensure that no coolant is wasted. A sturdy welded M.S Frame / S.S Frame. The magnets enclosed in stainless steel drum having powerful an-isotropic ferrite magnet with uniform magnetics filed all along the circumference. A neoprene rubber roller with cover bearings. A stainless steel blade with adjustments for an efficient scrapping of the sludge. An electric motor working 440 V with reduction gear revolving the drum at about 6.5 RPM. Customized design is also available. 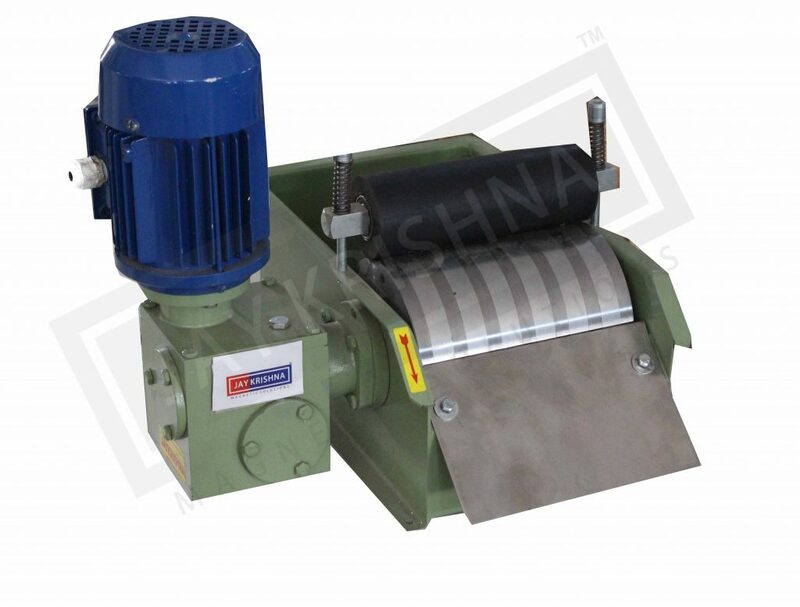 Jaykrishna magnetics is manufacturing coolant separators in the standard capacity of 50, 100, 150, and 200 liters/min.